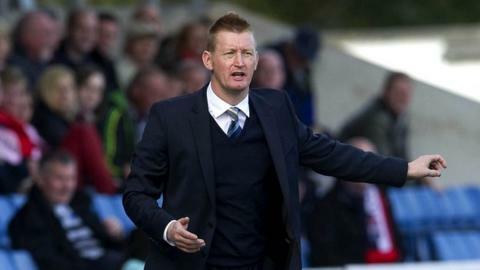 St Johnstone manager Steve Lomas praised his side after they brought Ross County's 40-match unbeaten league run to an end. Saints played over an hour with 10 men in Dingwall and Lomas was delighted to win 2-1. "It's a tough place to come at the best of times, but when you go down to 10 even more so, so we're absolutely delighted," he told BBC Radio Scotland. "To play with 10 for 65 minutes was a fantastic effort from our boys." The visitors took the lead through Liam Craig before forward Rowan Vine was dismissed for the second time this season. It was a decision that angered the St Johnstone manager. "I've seen it and I've had a word with the referee, he kindly let me in to chat with him," said Lomas. "It was a push from [Ross County defender] Grant Munro first, and Viney just turns round, the actual reaction from the player is a disgrace if I'm being honest. "Viney just put his chest out. For the big man to fall down like that; you'd expect that off a wee forward, but not from a big strong centre-half. Pretty poor, pretty poor." Sam Morrow equalised for County before Frazer Wright hit the winner for the Perth side with less than five minutes remaining. "We have been playing well, we've just not been creating chances," added Lomas. "I think the key is we've conceded two goals in three games and we're starting to score as well, which you don't need to be Einstein [to realise] is a good combination."